I love creamy cheesy pasta dishes, so even though I knew I wouldn't get to eat this recipe from Everday Foods magazine, since I've never seen jumbo gluten-free pasta shells, I still wanted to make it! Unfortunately the rest of my family doesn't love those types of pasta dishes quite as much as me. They liked these for the most part, but I know I would have appreciated them much more! I tried a little bite of the filling and I do think I would some salt next time. I also loved that I was able to get some extra veggies in the meal with the addition of zucchini to the cheesy filling. In a medium bowl, combine ricotta, zucchini, basil, and egg; season with 1/2 t each salt and pepper. Spread 1 cup marinara in a 9x13 inch broiler proof baking dish. Fill each shell with 1 heaping Tablespoon ricotta mixture and arrange in an even layer in dish. Top with remaining 2 cups marinara, then pepperoni and mozzarella. Cover with foil and bake until sauce is bubbling, about 30 minutes. 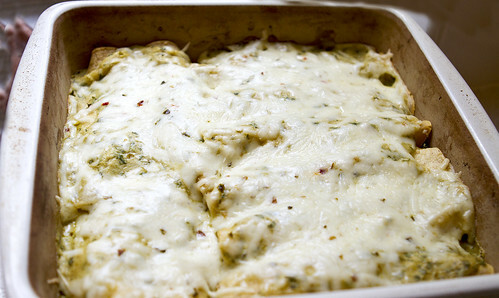 Heat broiler, remove foil, and broil until cheese is browned in spots, about 3 minutes. Top with additional basil and serve. Guess what?! My kids LOVED this dinner!!! That has not happened in a looong time, so it was exciting :-). 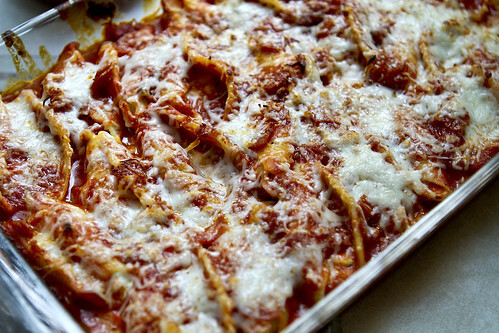 It is no surprise though, this is basically pizza in a casserole form...what's not to love. It is not gluten-free so I ate leftovers instead but the rest of the family ate up their crazy pizza so fast I couldn't believe it! Thanks taste buds for the super easy and fun recipe! Preheat oven to 350 degrees F. Spray an 8x8 inch baking dish with cooking spray. In a large skillet brown meat. Add mushrooms, green pepper, onion and olives (I chopped mine super small in a food processor first). Mix well to combine. Stir in pizza sauce. Remove skillet from heat. Separate biscuits and cut each biscuit into 4 pieces. Gently stir biscuit pieces into meat mixture. Pour mixture into prepared baking dish. Bake 20 minutes. Sprinkle shredded mozzarella cheese evenly over the top. Continue baking until cheese melts, about 10 minutes. Place baking dish on a wire rack and let set 5 minutes. After one not-so-successful recipe attempt this week (the chili bean stuffed peppers were yucky :-(! ), I was a little nervous about these enchiladas. They had potential to be a huge success but also a miserable failure. I L-O-V-E-D them! Rachael Ray recipes aren't always the healthiest but you can nearly always make some substitutions to help them out. I couldn't wait for lunch the next day to eat some more! 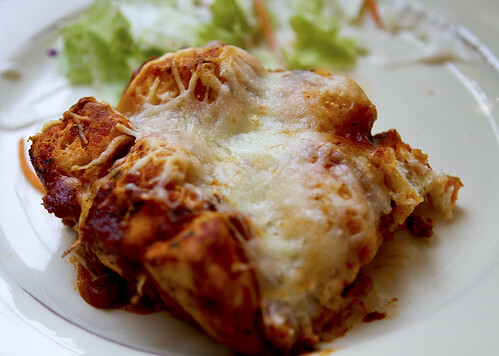 And even my meat-loving husband had no complaints about these meatless enchiladas. In a small saucepan, bring 1 cup water, the rice and 12 tsp. salt to a boil over high heat. Lower the heat to low, cover and cook until the water is absorbed, about 15 minutes. Fluff with a fork and transfer to a medium bowl to cool slightly. Add the beans, 1 cup Monterey jack, the scallions and cream cheese; stir gently. Meanwhile, using a blender or food processor, blend the salsa verde, cream and 1/2 cup cilantro until smooth. Mound 12 cup of the filling down the center of each tortilla. Roll up tightly, then place seam side down in a 7-by-11-inch glass baking dish. Pour the sauce over the top and sprinkle with the remaining 1/3 cup Monterey jack. Bake until bubbly, about 20 minutes. Top with more cilantro. I was really excited to try this healthy-fied version of potato soup. It is definitely one of my favorite things and I trust Gina of Skinnytaste to keep it tasting good even if it is good for you. This is so not bad for, yet still so delicious. 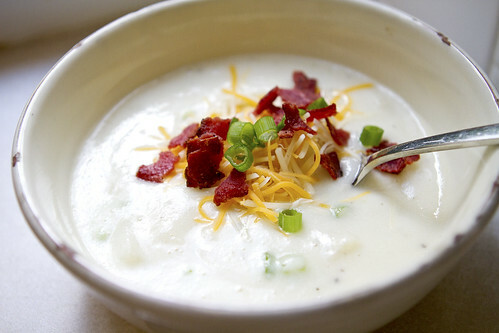 I loved it and my oldest, Ella, who is the other potato soup lover in the house, loved it too! Add sour cream, half the chives, salt and pepper and cook on low another 5-10 minutes, stirring occasionally.